This article is about the Tom Jones song. For the Forever the Sickest Kids song, see She's a Lady (Forever the Sickest Kids song). For the Blue System song, see Walking on a Rainbow. "She's a Lady" is a song written by Paul Anka and was released on his album Paul Anka '70s (RCA 4309, 1970). 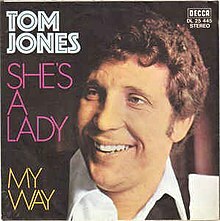 The most successful recording was performed by Tom Jones, and released at the beginning of 1971. It is Jones' highest-charting single in the U.S. to date (and his final Billboard Top Ten hit). "She's a Lady" hit #1 in Cash Box magazine for a week and spending one week at #2 on the Billboard Hot 100 chart, behind Me and Bobby McGee by Janis Joplin. The song was also a #4 hit on the US Billboard Easy Listening chart. Billboard ranked it as the No. 25 song for 1971. In Canada, the single reached #1 on the RPM 100 national singles chart. The song was re-released in 2013 on Paul Anka's " Duets" CD with a new rendition featuring Paul Anka & Tom Jones. Anka rewrote the first verse of the song (recorded with Jones) for his 2013 Duets album, because he disliked its chauvinistic sentiments. The single's B-side track was "My Way" whose lyrics were also written by Paul Anka. In 2007 as a single by Dutch singer Jeroen van der Boom. 1973 film That Man Bolt. Sung by Samantha Nightingale (Teresa Graves) in a Nightclub sequence. 1995 film To Wong Foo, Thanks for Everything! Julie Newmar. "She's a Lady" was re-released in Europe in 1995. The single included remixes by American DJ Junior Vasquez. 1998 film Fear and Loathing in Las Vegas. 2002 film The Wild Thornberrys Movie. 2003 film Bend It Like Beckham. 2006 film Flushed Away. Hugh Jackman's character Roddy St. James sings it in the film, but Jones' version is in the soundtrack. 2009 film Madea Goes to Jail. 2014 film The Little Rascals Save the Day. The song was featured in the 2003 episode of Futurama "Bend Her". The song and title was spoofed in the short-lived 2004 reality show called He's a Lady on TBS. The song was used in the 2009 Trop50 orange juice commercial featuring Kyra Sedgwick. The song is also used in TV spots for the British sitcom Keeping Up Appearances. In Season 4 of the American Dancing With the Stars, Laila Ali & Maksim Chmerkovskiy danced a Cha-Cha-Cha to this song in week 9 of competition. In Season 14 of the American Dancing With the Stars, Katherine Jenkins, Mark Ballas & Tristan MacManus danced a Cha-Cha-Cha to this song in week 8 of competition. In the last ever edition of The Weakest Link, at the end of the episode, a montage of Weakest Link moments were shown while "She's a Lady" was playing while the clips were being shown. This song is currently the introduction for Kate Voegele on her 'Lift Me Up' tour. ^ "BBC Wales - Music - Tom Jones - Tom Jones discography". Bbc.co.uk. Retrieved 2014-03-25. ^ Whitburn, Joel (2002). Top Adult Contemporary: 1961-2001. Record Research. p. 131. ^ "My Way: An Autobiography". Paul Anka. ^ "Item Display - RPM - Library and Archives Canada". Collectionscanada.gc.ca. 1971-02-27. Retrieved 2018-11-05. ^ "The Irish Charts – Search Results – She's a Lady". Irish Singles Chart. Retrieved November 5, 2018. This page was last edited on 29 March 2019, at 15:12 (UTC).